Cygnus is situated in the Milky Way. Its brightest stars mark the Northern Cross. Cygnus, with the bright star Deneb in the swan's tail, appears high in the summer sky. The three bright stars Deneb, Vega (in the constellation of Lyra), and Altair (in the constellation of Aquila) mark the Summer Triangle. Altair is about 40 degrees from Deneb and Vega. Albireo, the bright star at the head of Cygnus, is an excellent example of a telescopic double star. Even with binoculars, you can see that it consists of two stars of different colours, one is very orange the other bluish white. You must take a look at them. 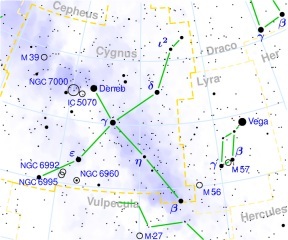 As Cygnus lies in the Milky Way, it is full of variable stars (stars with brightness that varies over a period of time) and there have been several novae in the boundaries of this constellation - the last was seen in 1976. The North American Nebula lies within Cygnus; it's very dim but is reported to be easy to photograph. The nebula needs a telescope with aperture larger than 6" to see it. Deneb 1.2 1800 L/Y 70,000 times as luminous as the Sun. Albireo 3.1 & 5.1 / 34.4" Best example of a double star, with one star shining red the other blue, magnificent.